I’m the kind of person who saves all kinds of scraps in the freezer. It might seem crazy, but, at the same time, I think of these scraps as treasures. I once read somewhere that the Eskimos teach that if you are going to eat meat, it is respectful to use all of the animal’s parts, and I’ve taken that to heart. Mostly, I save bones, particularly chicken bones. When I roast a chicken, I save the neck and the carcass. When I bone pieces of chicken, I save the bones. All these jewels get stowed in the freezer, and when enough are saved up, it’s time to make stock. The only thing about stock is the time it takes. That’s not necessarily a bad thing, but it can be a challenge to find the right block of time to make it happen. 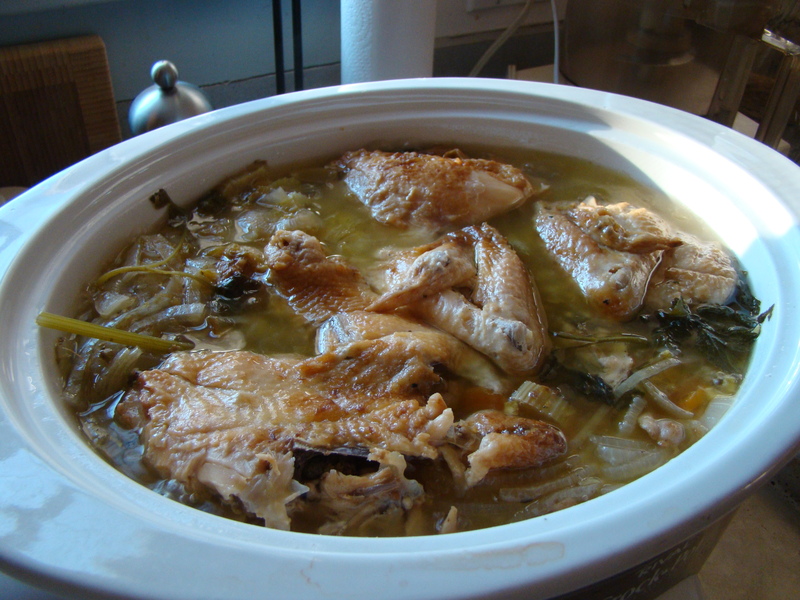 Then, I came across the idea of making chicken stock in the slow cooker. All the usually aromatics get added to the pot along with the bones, and it does its thing overnight, while I sleep. The slow cooker cooks low and slow, and I don’t have to be nervous and babysit the gas flame on the stovetop. Perfect! I love the convenience of the aseptic boxes of chicken broth, which I buy in quantity at Costco. But when the soup is brothy, there’s nothing like using homemade stock and letting the flavor shine. I’d been craving a bean soup with pancetta. I made stock while I was sleeping, and then put together a hearty pot of soup in the morning to be ready in time for lunch. The soup was chock full of vegetables and beans, and really hit the spot. I also tried my hand at this recipe for Rosemary Focaccia. I enjoy making homemade bread, but can never seem to get the timing to mesh with my schedule. It was a weekend, so I was able to make it work. Plus, focaccia doesn’t involve quite as much rising and waiting as loaves of bread. What a perfect weekend lunch! Sort the beans to remove any rocks or other debris. Place the beans in a large bowl, cover with boiling water, and soak for 4 hours. 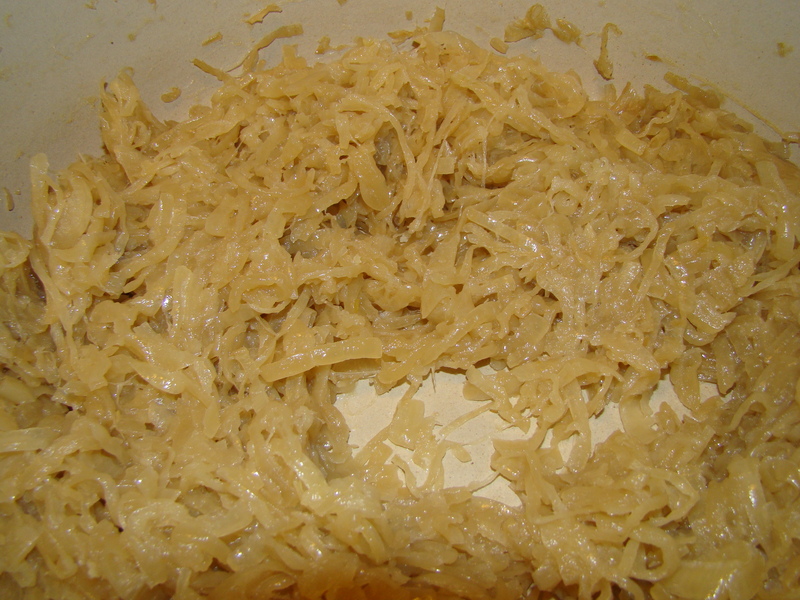 Drain and transfer to a large saucepan. Cover the beans with cold water, bring to a boil, then reduce heat and simmer until they are tender, about an hour. Drain the beans, reserving the cooking liquid. Heat the olive oil over medium heat in a large soup pot. Add the pancetta, and cook until it starts to brown, about 10 minutes. Add the celery, carrots, onions, leeks, potatoes, tomato paste, stock and water. Bring to a boil, then reduce the heat and simmer for 30 minutes. Add the kale, and continue to cook, until the vegetables are tender, about 15 more minutes. In the meantime, puree half the beans with ½ cup of reserved bean cooking liquid. Add the whole beans and the bean puree to the pot. Simmer for 5 minutes, until everything is warm. Season with salt and pepper. It’s the last recipe in February for French Fridays with Dorie, and, in my opinion, the month ends on a high note. 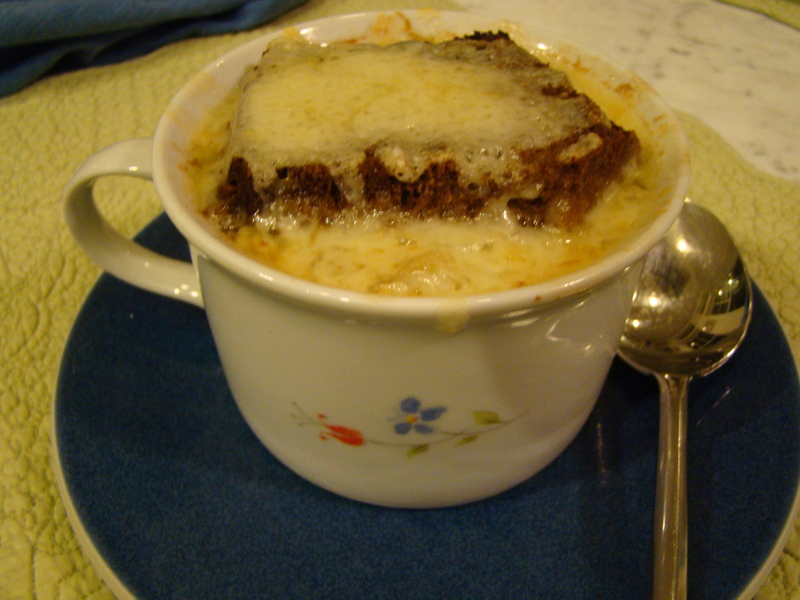 This week’s assignment was cheese-topped onion soup, in other words, classic French onion soup. 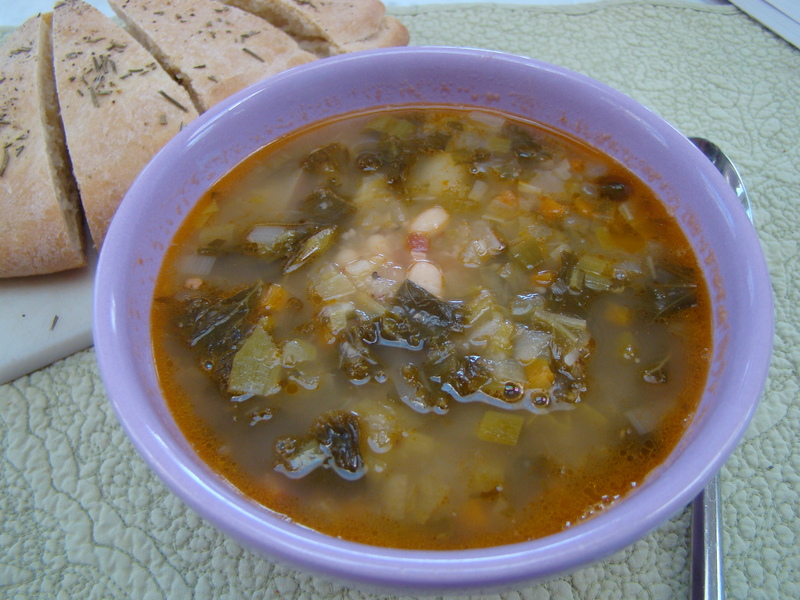 We loved this soup at my house. It definitely ranks in my (constantly changing) top 10 FFwD recipes so far. 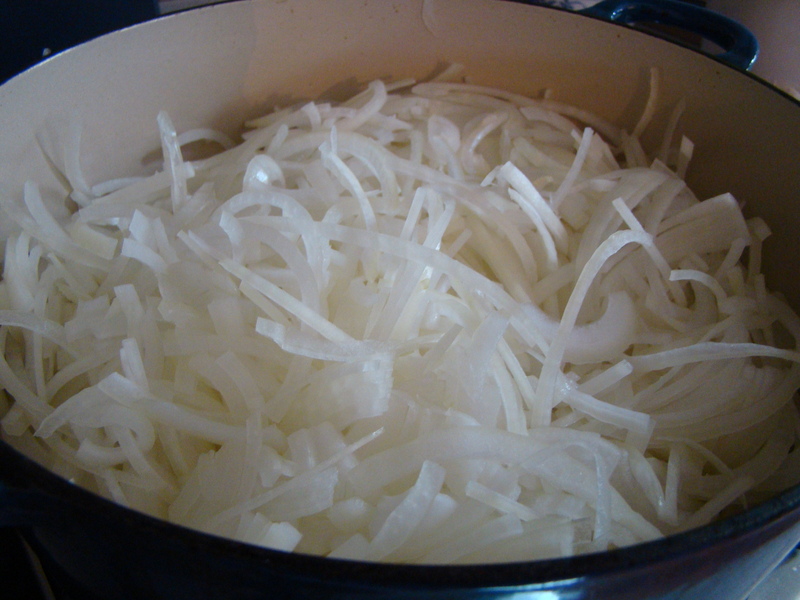 I think it’s safe to say that the last time I made French onion soup was at least twenty years ago. Previously, I’d always made a version from Julia Child. While I always enjoyed it, the deterrent was its beef broth base. Homemade beef stock was never in the cards, and the canned version was never very appealing. I usually resorted to beef stock from boullion cubes, but that was always very salty. The revelation with Dorie’s version of this soup was its chicken stock base. It never occurred to me on my own to use it, and now that I’ve done it, I can’t imagine why I’d ever make it any other way. I even had time to make my own stock which I’m sure gilded the lily. Fortunately, I didn’t work on Monday, the President’s Day holiday. My onions took the better part of the day to caramelize, and, even then, they were closer to golden than caramel. I thought the color was good enough, and the taste was very sweet. My onions were also extremely wet as they cooked. They exuded onion juice. I poured about half a cup or more of liquid off at one point because the onions were steaming with no chance of browning. I don’t know why onions take so long to caramelize for me. I remember having the same experience when we made the pissaladiere. I wonder I’m taking the directions about using low heat too literally. You know how you are always torn when you have some special-purpose kitchen item, a dish, tool, or gadget that you seldom use, but can’t bear to part with? Well, I guess that’s why I still had the ovenproof soup bowls that I last used a couple of decades ago. They were sitting in the cabinet just waiting for this week. 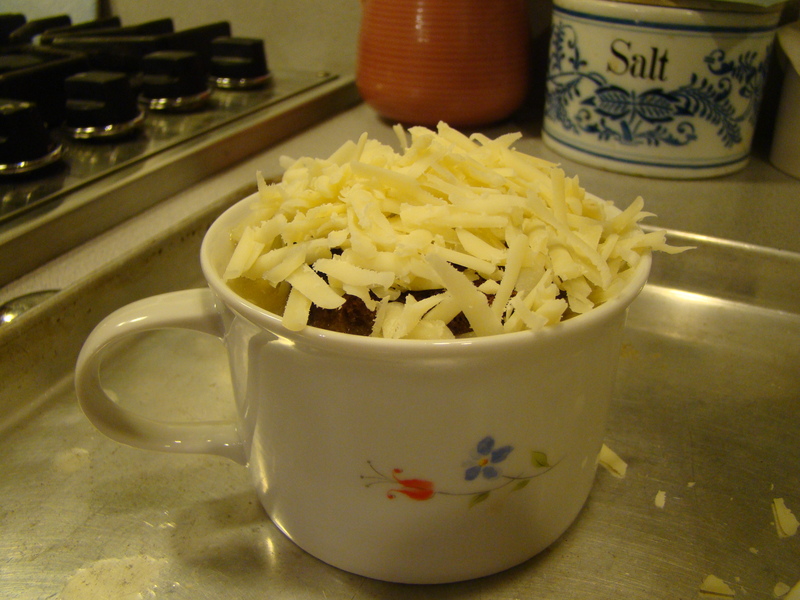 The bowls were filled with oniony broth, a spoonful of brandy and topped with toasted hearty bread (I used pumpernickel) and a hefty dose of grated Gruyere cheese. After a couple of minutes under the broiler, voila! A burning hot soup, which Dorie tells us is called brûlante in French. 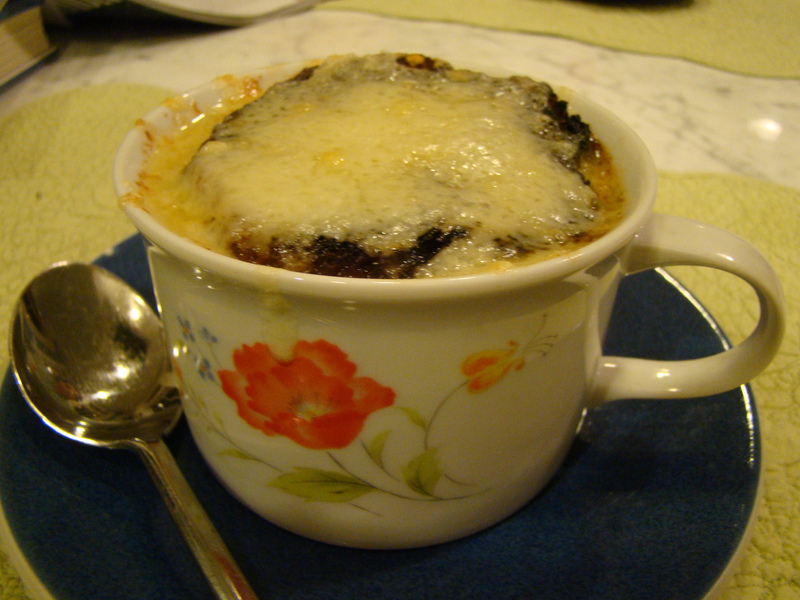 We had cheese-topped onion soup as a starter before dinner two nights this week. It’s not very easy to assemble the full treatment at work with just a microwave, but this soup on its own (naked? ), without the cheesy topping, also made a satisfying lunch. All in all, this was a sure-fire winner. I typically make soup at least once a week, and Dorie’s version of onion soup will become part of my soup repertoire. We don’t share the recipes in this cooking club, but you can find it in Dorie Greenspan’s book Around My French Table. You can read what the other FFwD bloggers thought about this week’s recipe here.